Most mainland time zones change for daylight savings. The Hawaiian time zone does not change. Please do not send returns without first obtaining authorization. Please ship all returns to our Post Office Box. Of the many wonders of Hawaii there is one small, but significant one; made in Hawaii clothing. Many prints capture the essence of the Hawaiian lifestyle. The local people and the wonderful, curious streams of tourists from all parts of the world love, and sometimes cherish and even collect Hawaiian print clothing. Locals are inherently kind, generous and adhere to strong ('Ohana) family values. They have unique respect for their island land ('Aina) and the ocean (Kai) that surrounds them. The spirit (Aloha) of the islands is captured in a never ending stream of images and color. The images displayed on Hawaiian clothing are full of beautiful and wondrous flora. The expression of the ubiquitous hang-loose is in the essence of many prints. There is a feeling of freedom from the open collar from a men's tropical print shirt; no more ties. The bright colorful, comfortable fitting women's dress for grandmother ('tutu) are abundantly available; the mu'u mu'u or house dress. Floral tropical prints are common sights in the neighborhoods of every Hawaiian city and town. The Hawaiian print has become more than an alluring symbol of the islands. It is dress de rigueur. The Aloha print of the Hawaiian style clothing is recognized everywhere in the world. The Hawaiian lifestyle is relaxed, laid back and hang loose. Many times tourists prefer the loudest, brightest, outlandish prints for fun. Beautiful Hawaiian prints come from recollections of ancient tribal motifs embedded from generations living with respect to the island's nature. Tropical Polynesian prints are worn for ceremonial occasions, themed parties and weddings. Restaurants, hotels and bars employ their worker with Hawaiian prints for uniforms. You've heard of Aloha Friday. Many mainland companies have an Aloha Friday day. Each employee have the option to wear a Hawaiian print shirt or dress. Starbucks Coffee and First Hawaiian Bank are two local organisations that do this. Hawaiian prints are embodied in hotel entertainment luaus as well as Mainland backyard luau parties. Many Hawaiian style shirts reflect a myriad of themes or topics; parrots, airplanes, turtles, guitars, ukuleles, Christmas, tropical drinks, motorcycles and even pink flamingos. It is common to find an Hawaiian print reflecting the abundance of our islands' nature. Aloha prints display tributes to ancient traditions, today's and yesteryear of island life styles. Hawaiian island's history and it's traditional symbols can be found on an adult or child's T-shirt as well as all styles of Aloha wear. Much is said about the never ending images that express the nature and spirit of Hawaii as it is displayed on the local clothing made in Honolulu. The showroom contains tens of thousands of shirts and dresses. The showroom is packed from floor to ceiling with hanging made in Hawaii garments. 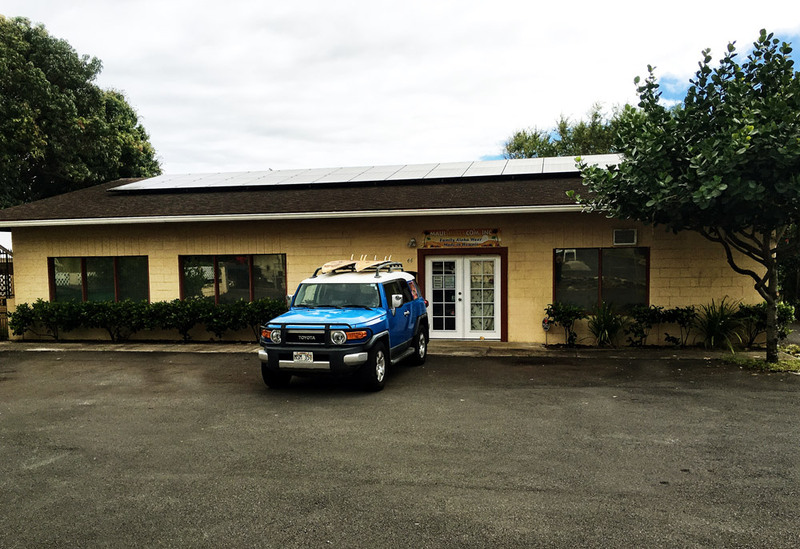 No other retail store on Maui, bar none, comes close to the variety and stock on display at our showroom. You will be truly amazed. Please DO NOT bring children unless you can manage them. No food, drink or smoking allowed in the showroom. Mornings are occupied with picking, packing and shipping our on-line customer's orders. Federal Express picks up at 11:00 A.M. weekdays. We are passionate about shipping your purchases out to you as fast as possible. MauiShirts.com ships hundreds of packages per week to the mainland and all parts of the world. 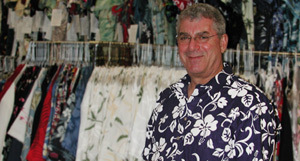 MauiShirts.com was established as an on-line internet source of made in Hawaii clothing in 1998. We offer Paradise Found, R. J. Clancey, Kalaheo, Shannon Marie, Puanani, Two Palms, Cubavera white pants and shirts, HIC Hawaiian Island Creations Boardshorts, Bamboo Cay Swim Trunks, Rugged Shark & Teva Sandals and Shoes, Sportailor emboridered shirts and cargo shorts and other brands and much more. There are over 40,000 on-hand items of Men's, Women's, Girl's & Boy's shirts and women's styles hanging in the showroom/s at all times. Many Paradise Found, R. J. Clancey, Shannon Marie and Cubavera prints and styles are 100% owned by MauiShirts.com. No other retailer or on-line seller offers more of a variety. MauiShirts.com supplies many mainland, international and Hawaiian restaurants and hotels with matching shirt and dress uniforms. 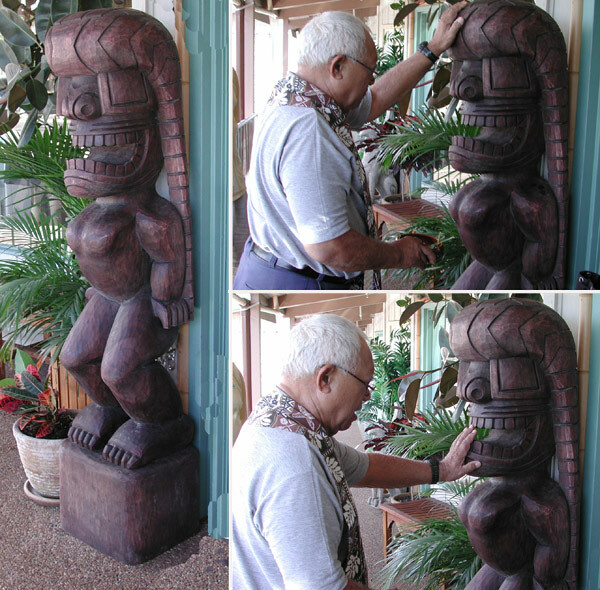 On March 4th, 2008, the long awaited hand carved tiki arrived. It required six months to carve, dry and stain. The Hawaiian Temple Image, Kuka' ilimoku, was the personal War God of King Kamehameha I. The great warrior chief, Kamehameha, gave this deity of war, credit for his success, in uniting the islands of Hawai'i into one Kingdom. 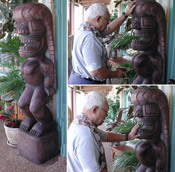 The Tiki, Kuka' ilimoku, was hand carved from conception, Oct., 2007, by TikiMaster, Kailua, Hawaii from Acacia Koa Wood, (Monkey Pod). The Tiki, Kuka' ilimoku, was respectfully blessed by the Reverend Kahuna Earl Kukahiko, March 4, 2008. Tiki Kuka' ilimoku specs: 28 cubes, 68" High, 20" X 28" wide, weight approx. 200 lbs. Top, from left to right: Rentin Bruce Horswil, Robin Rael, Mickey Steinborn, Dave Aguilera, Kahana Bob, Johnnie Pender, Big Kahuna - Earl Kukahiko, Mary Fay, Steve Perron. I am here with Robin Rael and the Big Kahuna - Earl Kukahiko. That's Kahana Bob in the background. She has been a resident of Maui for over 20 years, and truly embodies the spirit of aloha.